That tiny swirl in the middle of the Atlantic is Irma, coming straight for Houston. The big swirls set the stage for hurricanes and they are slow to change. So lots of hurricanes follow the previous. Whether they get big depends on how much heat energy the previous one sucked out of the ocean. Harvey only became a 4 just before landing, so Irma may make it all the way to Houston. 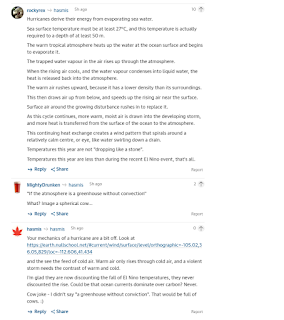 The English major warmies (emw) can't get the idea that cold air is important. 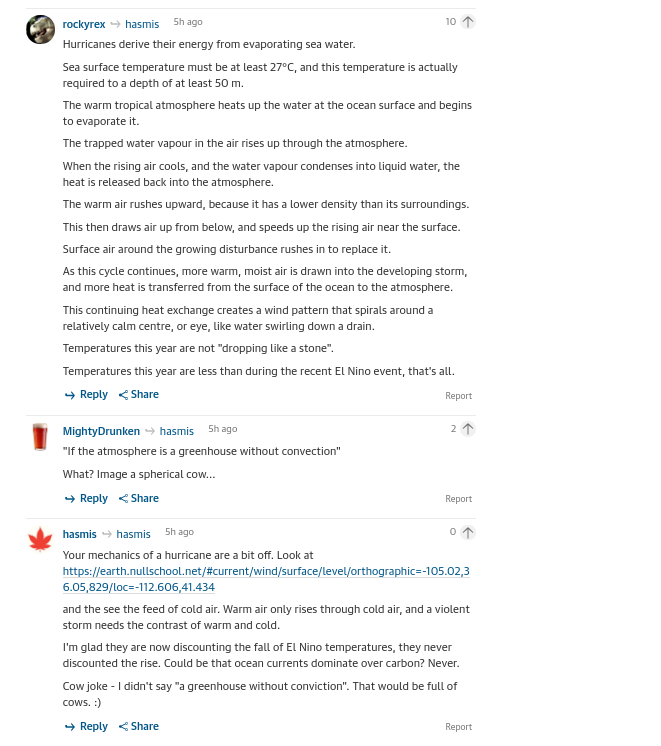 The big thing now is 'warm air holds more water, therefore we get more rain'. Pooey. That moisture would stay in the warm air forever if they're weren't any cold air to wring it out. When I point out that temperatures are falling like a rock, they come back with a 30 year moving average, which no emw uses for their headlines. It's all 'Harvey is a made-made disaster' due to warmishing. Okay, let's put 'paving the entire watershed' up against gorming. Who wins? Anyway, the hurricane has moved on, but this shows the tremendous storm activity caused by our cold zooming down from Siberia. This is a neat picture. Everybody who designs things, has to think about extreme events. My main experience is earthquakes, but the same physics applies to flood, wind, fire, etc. So, in the 30's when most cities were designed, it was a big thing to go with the 100 year event. That's what you designed for. Skyscrapers, drainage channels, etc. In 1954 Toronto was hit with a 12 inch slug of rain and subsequent drainage was designed for that. However, Toronto has been been hit by several slugs of about 4 to 6 inches, and the sewer system has been unable to take it. But these were not major flooding events. The problem with an initial design is that events overtake it. Houston was theoretically designed for a 12 inch slug, but then they paved the entire watershed. They get their 100 year flood almost every year now. Hurricane Harvey with a 50 inch slug of rain was way over the top. 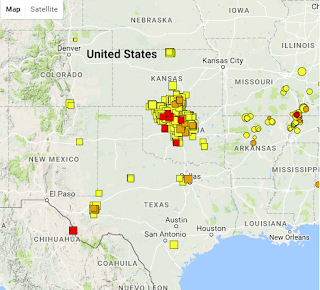 Because of rampant development, nearly all North American cities are getting frequent flooding. The initial design is irrelevant because they did not stick to a plan. ps. I believe that a city should be able shrug off the 100 year event, and recover quickly from a one in 500 year event. That goes for all causes, including earthquakes. Yet, time and time again cities are destroyed by the 500 year event. I subscribed to the British Guardian as the most left warmie-supporting paper in the world. They have great investigative articles on trumpy as the master coin-wash man of all time. Good thing he can pardon everybody. This was an extreme lefty opinion that Hurricane Harvey would have been a puddle-washer had it not been for global warming aka climate change. I had to wade in and had a fun time. I have to publish this fun in graphics because you can't cut and paste. I am very impressed by the perfection of the swirl. Very cold Siberian air and warm equatorial air, in a totally stationary whirlpool. Houston will get another big slug of rain. If they are lucky, it moves on. Harvey is still not leaving. Ok, I haven't installed it, but I'm planning and doing stuff. First, specify and order the camera. I want to put a cute dome camera on the far corner of the house, so to be ready for the next Mob murder. I want it to be 'starlight' or very low light. These are normally expensive, but Aliexpress and directly ordering from China comes in here. Anything neat is not made here. You want the cheapest and this is a powered ip camera, over power over ethernet. poe. You only need to run ethernet cable to the far corner. At the nearest plug in the garage, you put in a poe injector. This has a little power box to zap up the ethernet cable. The power is carried on the spare leads in the cable, it seems to have a lot. Now the hard part. I wanted to put a cable through a penetration that I had foamed up for the mousies. Blah. However, I had an extra wifi extender and I tested that. Yeah! Now I wait for the camera. ps. got my cable, and my injector. Now I have to wait for a month or two to get camera. Also got these neat little clips to hang the cable. Visited Houston once. That was when we were gathering vibroseis tapes for the Great Lakes. These were the records that showed the megathrusts that everybody in the States ignores. Fun times. Now, the warmists can blame their thing for this hurricane, but it takes two to tango. The meet-up of intensely cold Siberian air and warm Gulf air causes this. If we were all just warmie-happy, there wouldn't be hurricanes. I'd be going to my cottage six months of the year, drinking lots of beer. But, nope, it's the end of happy warming. ** We must hope that nazties will build new subsidized housing for the criminals and rapists. **Really, the US nazties own all the slums and refuse to do basic repairs. That way the city condemns the place and gets rid of the tenants. Then the condos go in. I saw this in Chicago. Twenty years ago the train went by the worst bombed-out slums you ever saw. Now it's a huge condo complex. This will end in civil war. **there was no evacuation plan for Houston, ever, for anything. The Mayor said he wouldn't pull the trigger for anything. Neat. pps. I'm sorry, but I can't donate to Texas. The situation in Texas has been rapidly evolving over the past few days, and Direct Relief has been monitoring and responding to Hurricane Harvey and subsequent flooding around the region. A team has been on the ground in Texas since Friday, connecting with partner healthcare facilities and assessing additional needs. In June, Direct Relief prepositioned eleven Hurricane Preparedness Packs at clinics in vulnerable areas and along evacuation routes throughout Texas. This program, in place for the 12 years since Hurricane Katrina, ensures that essential medicines and supplies are immediately available should an emergency happen. In the days since Harvey made landfall as a category 4 hurricane, medicines in three of these emergency reserves have been used by local health providers to care for people affected by the storm and its aftermath. To further support relief and recovery efforts, Direct Relief has committed an initial $200,000 cash and made available its entire inventory of more than $100 million in medical resources. The road to recovery in Texas will be long, but Direct Relief is committed to supporting health care facilities throughout the state both for immediate relief and long-term response. Your support is critical to enable the rapid mobilization of medical resources to people in need. Thank you. Just saw this on US tv. This is hilarious, since Walmart set up all the hate by destroying small towns, isolating people in their cars, and direct imports from China. However, they have the money. Honestly, why didn't xon go the high route with atmospheric physics? They had the money, but no brains. They went with linear extrapolators. And then tried to cover up the 'momentum' gabbers. 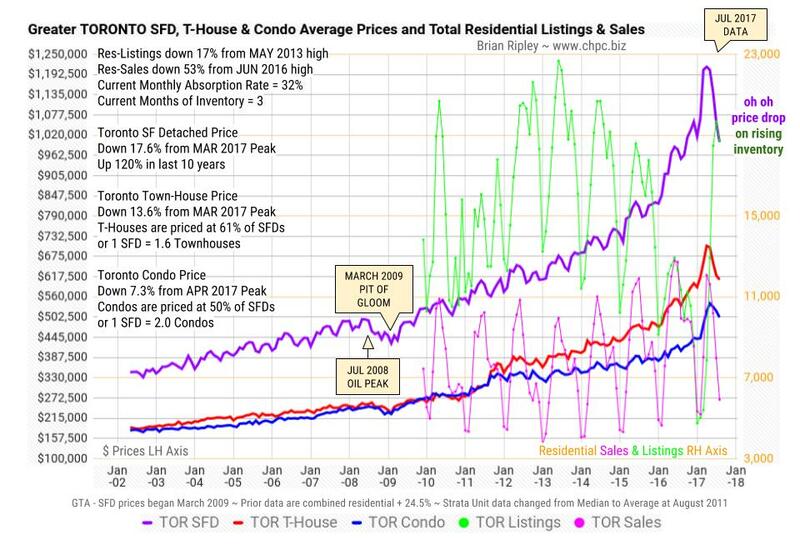 Next month's charts will be the same as Toronto housing prices -- straight down. The only thing the chartists can do is chop the charts at 2016. Next year they'll run and hide. But we can give xon grief for being so stupid. Clear, high 22, low 6. Beautiful fall weather for staining. We actually have a few days without rain. As I have said, the end of phoney global warming. Will take another year before they all hide. A trillion dollars wasted because of no physics. Houston is taking all our rain. That should take all the heat out of the Gulf. Probably means we'll freeze earlier, and I hope the cottage pump doesn't freeze before Thanksgiving. Sunday continues to be nice painting weather. I took a 2 second dip in the lake. I just like these charts. I'll have to wait until September for my usual chart. Milton was the worst, with everybody owning 2 homes. ps. the very survival of the banks depends on this thing stopping at 20%, so right now they aren't alarmed. We have several abandoned houses for sale around. They had nice families in them one day ... and gone. Right now I think you can sell with a 10% haircut, otherwise the newspapers would be screaming. pps. These guys are already saying the discount is now 20%. This news article explains that the editors of a journal for Chinese scientific consumption were told to take out a lot of articles and they meekly did. Then there was a ruckus, and weasels suddenly puffed up their chests in the name of freedom. I now propose that all scientific articles append to the their titles "as pertains to political power in China". "Latest results in quantum mechanics, as pertains to political power in China". It is also necessary to add at least one quip: "Tolerances must be as tight as the central control in China". With this effort we don't have to worry about those two countries anymore. ps. Ha, news of the big reverse is also being censored. Somewhere in the bowels of NADA there is a building with a sign "No basic physics allowed". If the Universe obeyed signs, then that building wouldn't stand, but it does, and it is full of people who ignore the basic laws of physics. They gave us the concept of a 'greenhouse gas', without knowing that a true greenhouse gas would be greenhouse glass, and we'd all be dead. As long as you allow the tiniest bit of convection there's no greenhouse. And the ozone hole. They should have known that in the centre of a really good polar vortex, it is so cold that no reaction takes place. Now, no newspaper in the world wants to look back at that (God knows I tried). All these little things just took a trillion dollars out of the economy. Who cares? But now they want to destroy the world. Yes, the Yellowstone super-volcano, along with about 20 others. They want to pop this zit before it bursts again. Their singular desire to venture into areas of which they know nothing, has come up with a plan. 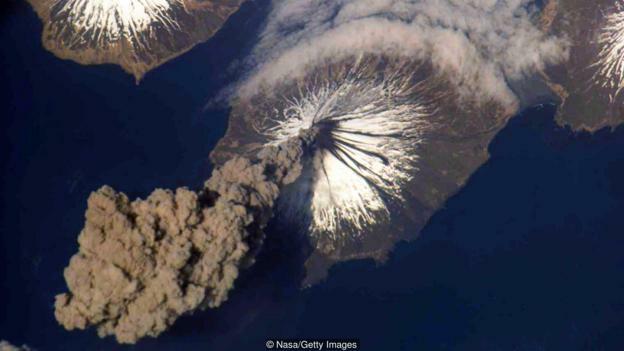 Why don't these volcanoes blow up tomorrow? Because they have a super-hard solid titanium top cap. Must be true because it sounds so good. They want to cool it down, but not by drilling into the titanium top cap, because that might weaken it and sends things off. No, they want to attack the flanks, which any true storyteller knows has nothing to do with the volcano. Now, if they had a tiny bit of rock mechanics, which is the physics of rock, they might be alarmed at this ridiculous approach. For it is the strong flanks that keep a volcano down, the top is shot to rat poop. A volcano only comes to life when the flanks collapse, thus squeezing the magma like a lemon. 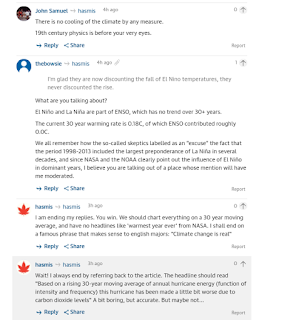 Alas, as the cold Siberian air comes down to finish global warming, nobody will look back at all the things that came from the Building of No Physics. This project will go ahead and most likely nothing will happen, I hope. ps. they want to do something called 'Hot Dry Rock Extraction'. This has never worked and never will. pps. Actually, in order to do anything, they have to stare Physics in the face. Ha! I really can't find too much to write about these days. However, we are going for a week touring around Newfoundland, and that's exciting to plan for. Oklahoma Earthquakes: Trumpy has driven the economy into a hole and natural gas is bouncing along the bottom of the price chart. No big earthquake this year. Global Warming: Watching the temperatures fall is like watching grass grow. In fact, my grass has grown at a ridiculous rate with all this rain. If I make fun of warmies on the leftie newspapers, they just cut off the temperature charts at 2016. 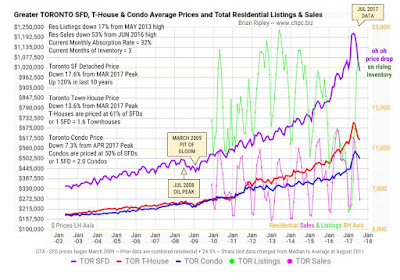 Toronto Housing Crash: Same as global warming. Went up Tuesday for two nights, which is all I can stand alone. The dog keeps me company. Anyway I need 2 days in a row without rain to put on that Deckover stuff. And this summer, that's a rare event. So, rain overnight Tuesday, but Wed was perfect, hot and not a puff of wind. Not superhot either, but hot enough when working on the deck. I could put up the dock sun cover for about the fourth time this year. Naturally, with weather this good, not a nibble when fishing. But I came home on Thursday, racing a huge rain front. Oh well. Yeah, he is back from va-kay, and did the chart. I'd do these things, too, but it's too much like work. The market people say this is a blip. 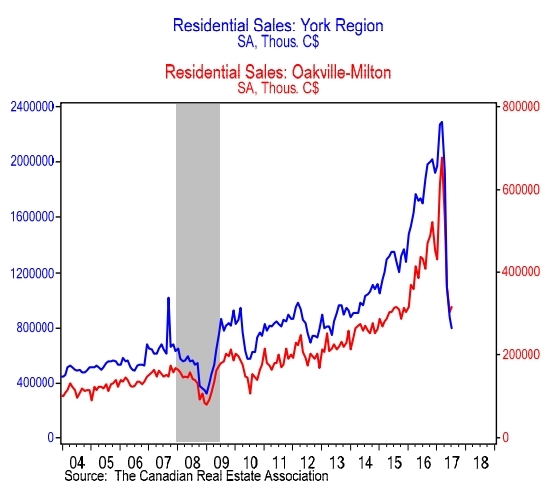 Condos are still strong, etc. Believe that prices are only going to drop 10%. Happy thoughts. ps. the abandoned house on the corner sold. This was a 'must sell', and they probably took a 10% discount. No 'sold over asking' here! Roxie loved her cats. If they didn't want to run, Roxie would stand off until I got her. She learned to kiss one cat. As well as cats, all our raccoons have gone. We also have a big Peregrine Falcon family and some of them are huge and stalking in the bushes. No pigeons are left, and much less squirrels. Oh man, this is the best scanner ever, if you really need a scanner. I'm uploading all my really boring papers to Google Driver. The scanner makes them pdf, and then you upload. It works perfectly with Linux, if you kill yourself putting in all the stupid libraries. Nevertheless, this is what Linux users put up with all the time. The windows guys get it easy, along with easy wannycries. It's super fast, and does both sides at once. I'm keeping it. Yeah, it's nice weather for a few days. I'm trying to put on some stain and I can't have it pouring rain right after. The nice weather means I'm not catching any fish. Right now I'm enjoying the effects of Cana-doil, 50% CBD and the dog is finally sleeping. **young people should really not touch any of this stuff, since we want them to pay for our Depends. Day Two - Absolutely a wonderful summer day. I think that's the second one. I have my dock tent out and drinking fine great lakes beer. Maybe the tent has been out 5 times? I'm getting a lot of stain on. We have established in the boring stories for kids, that the oceans carry heat 4000 times better than air. Wet air is 10 times greater than dry air. Here is the latest dry air motion, as determined from wind gauges. Notice we still have a perfect Arctic vortex. There's going to be a huge ozone hole, but we'll never hear about it, because that whole ozone thing was the biggest embarrassment ever. Is a university going widely publish "We made the biggest mistake ever!" Nope. 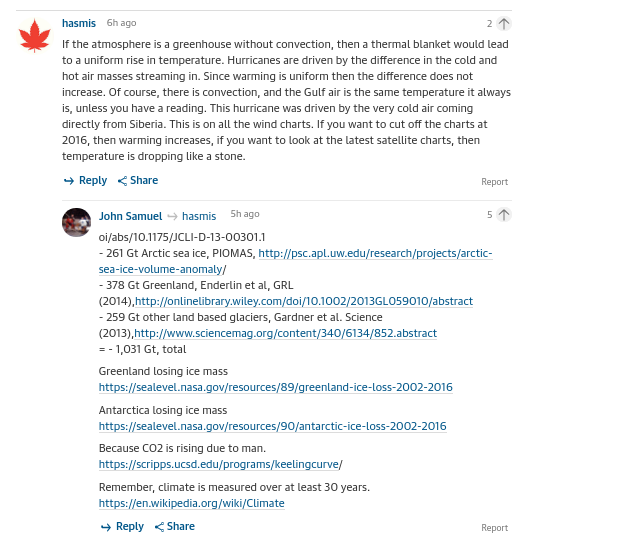 Are warmies going to publish a retraction? 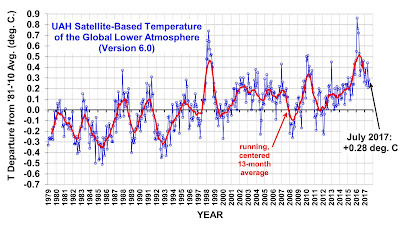 No, they are still going strong, cutting off the temperature chart at the end of 2016, including the El Nino peak as 'proof'. The Gulf Stream is being viciously attacked by Arctic cold water. I haven't seen this in the many years that this chart has been available. 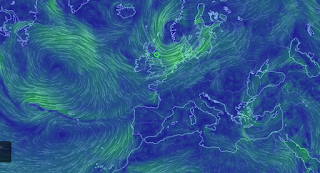 It doesn't really show that much, other than Europe is not getting any rain. We, in Toronto, are benefiting from Gulf air plumes. It's a portable scanner that I reviewed. In my review, I mused who even uses scanners these days? Anyway, getting it to work on Linux was a killer. Epson has the president's nephew write the drivers. You look at the script and you wonder if Grade 5 could do better. I eventually got it working by using their generic program, configuring and compiling. It needed a zillion new libraries, so I must have done 'make' a dozen times. Anyway, it's super-fast and if you deal with paper input, then it's great. The stupid advertising has the print to the front, but it only scans print to the back. There it is, women get paid less for the same qualifications (university degree) and job title (programmer). On this basis there are probably a lot of men that get paid a lot less than the top at that same job title. This is the end of the Silicon Valley Method. That is paying some people an obscene amount of money if they are producing at more than 10 times the average. Anyway, most people in Palo Alto know that the only way to get paid enough to live there is to have a start-up and become 'acqui-hired'. The job title and qualifications are the same but you get paid 10 times as much as the hired staff. This can't go on. Big companies need a thousand job titles. My old company was totally commie in how it paid. Everybody got the same. There was no production. It was the old thing: "They pretend to pay us, and we pretend to work." Nobody was happy, but this is the way of lawyer-controlled life. Tesla is going to find that out, as well. No use snagging the top designer, top tunnel person, or whatever. What are you going to call them? Programmer, designer, geotechnical engineer. **really, the super-insane creative programmers are all men, live on jolt, and they die at 40. Women are too smart for that. They want a life. Okay kiddies, this is the last physics boring story to put you to sleep. As we know, plate tectonics always wants to kill us. It hasn't killed off life for 3 billion years, but it always tries. It always rearranges the continents until it's successful. The philosophers think a little breathing can kill off life, but that's nothing like pt. The last time, pt clumped all the continents together and gave us the Mesozoic. Although you want to ride the dinosaurs, you would have found the air a little thick. Oxygen was a little higher and co2 was through the roof. The air was thick with constant water vapour which is why everything didn't burn up with the increased O2. Large mammals like us didn't exist. You couldn't run away from the t-rex without dying of heat stroke. Thank goodness tiny mammals made it through, mostly by hiding underground. But then pt played its latest hand. It separated all the continents. We're part-way through total separation since the Atlantic is smaller than the Pacific. But in another 60 million years that should be even. What then? Well, we have fun with 'Snowball Earth', when pt tries to freeze us. Any boring story about physics is sure to put the kids to sleep. When I tried to teach the kids how to fix computers, they said "Unlike you, Dad, we were born with electricity.' To paraphrase, they also implied 'Unlike you, Dad, physics has no impact on our lives whatsoever.' I feel that this is the entire world, at least those that do fb. My son flies around the world in his VR room. At least I got the kids next door to pick up shiny rocks. That's a good step. But on to the love-hate relationship life has with plate tectonics. Without pt we would be as dead as Mars, but pt keeps trying to kill us. We have the large pt cycles of 150 million years. So for 150 myrs it is too hot for mammals and only dinosaurs roam, and the next 150 myrs is too cold, and only large mammals live on land. In the ocean, nobody cares about pt because the ratio of water to land has remained exactly the same. That's amazing! (No, it's not, say the kids). The plates move around like the foam on boiling porridge. They have this great habit of fully separating and then clumping together into a big lump. Non-physics types would think that this has nothing to do with anything, but they are wrong. Perhaps they are right, in their own way, since homanids have been around for the last 8 million years, nothing in the pt cycle. On a local scale, pt tries to kill people with earthquakes and volcanoes, but these also give life. Everybody and their dog want to settle on the slopes of an active volcano because the soil is so rich. Giant faults may be the only source of water. But the large cycle has always tried to kill life. When the plates clump together, amazing things happen (kids should almost be asleep now). All that buried ocean crust gets baked. Huge amounts of water and co2 come out. Since water vapour is the only effect insulating agent, the earth gets warm. Plants love this. They grow in great gobs, and give us coal. Dinosaurs try to eat the mammals. Volcanoes everywhere try to kill us. Such a miserable summer, you are going to have trouble putting the kids to sleep. Boring stories knock them out right away. Say it in a slow voice. I've written many boring stories here. It's all good science (following the Scientific Method). This is one nobody believes and they won't remember it in the morning. My kids never had anything to do with physics. Okay. -- In a world of science, the Earth is mostly ocean. The ocean surrounds us and totally controls our climate. Volume for volume, water carries 4000 times more heat energy than air, and wet air (precipitable) carries 10 times more energy than dry air. Our Earth is warm, and thank goodness for that. Higher life needs a very narrow temperature band, and organic chemistry (the type that keeps us alive) has a maximum reaction speed at our body temperature. Isn't that amazing? Not really, since any animal that strayed too far from that would be at a disadvantage. For 3 billion years, our Earth has maintained a perfect temperature for life. No giant heatwaves that killed everybody. No total freeze-up. Life toddled along. During that time, we've had every possible 'disturbance' possible, factors of 10 times what we humans can do. What saved us? The oceans. For through out that time Earth has had a major problem with getting rid of heat. We've had the Sun baking us, and even worse, the earth itself had to cool from a molten mass. Luckily we had water to act as a giant heat pipe, just like water cooling for your gaming machines. The cooling had to be better than my son's gaming laptop. What saved life (since humans weren't there at the time)? Carbon dioxide, and the fact that the atmosphere wasn't a greenhouse. This was despite the fact that we had methane instead of oxygen. 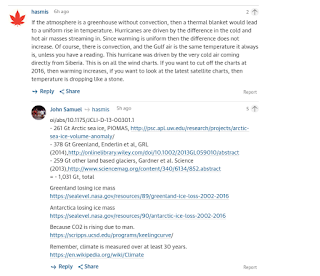 Can you imagine what would have happened if all that 'greenhouse gas philosophy' was true? No life. Lucky for us the atmosphere is a vigorous mass of convection, not a greenhouse in sight. That brought heat energy (which is molecular vibration) to the upper atmosphere where carbon dioxide lit up like a lightbulb and radiated all that heat into space. If you were on the Moon, with your infrared goggles, you would have seen that the Earth is a very dim star. Also lots of microwave energy. That's what saved us at the beginning, and the next boring story is how we have survived through billions of years of nasty plate tectonics. With the end of this miserable long weekend, we can officially call this a miserable summer. For the 10 years that our monster El Nino was building up, we had wonderful summers. Now it's back to the usual -- meh. Huntsville had it even more miserable, with all the sharknados. The whole family left early. I'm left with the dog to do miserable work. The rain's coming in and I'll have a fire. We've used the sauna a lot this summer, the first time for 10 years (in the summer). The good news is that our cottage potato patch did well this summer, normally it gets dried out. ps. horrible weather means good fishing. 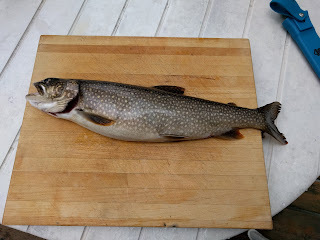 Here is my lake trout, delivered by uberfish. This is me at the cottage, north of Peterborough. I take a lot of steroids to look good without a shirt. 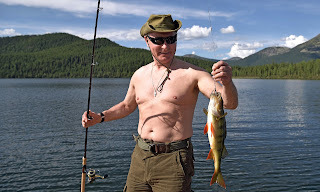 Somebody else caught the fish, but I had to pose with it. We are having a Siberian summer because the Pacific has shut down and the air is coming straight from there. Once in while we have a trumpian hot air mass coming from the south, but that is getting scarce, what with his siberian troubles. In o-siberia, we wait for a few minutes when the sun is out, and we're sheltered from the wind. Then I can take a photo. For the rest of the time I'm up the hill cutting wood for the winter. I like to take these pictures so everybody in siberio can think it will get warmer, with all the warmies yammering about that. ps. Drizzle flurries off Georgian Bay. Smells like snow! pps. All over, trumpfront coming in. While we are about to get Siberian air, eu is in totally stagnant air, with it slowly drifting up from the Sahara. I'll never be able to make fun of the euro warmies now! They are dying with 40 deg. temps. All the warmies will be happy, it's the end of the world! 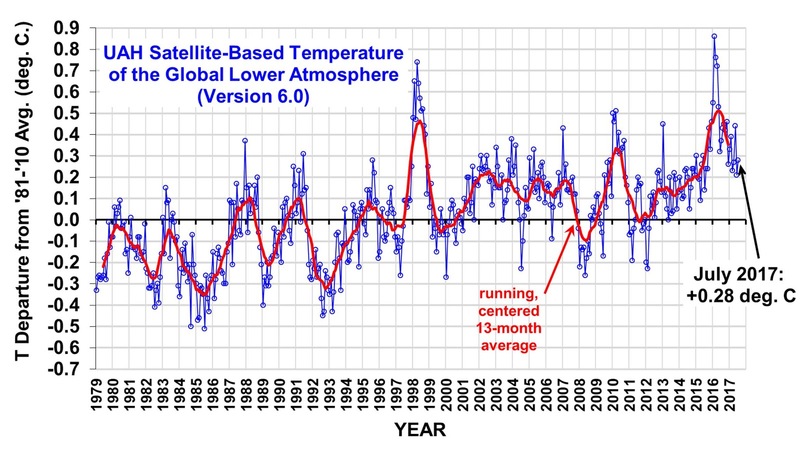 Meanwhile, global temps are diving. ps. the latest ocean current map show the gs totally destroyed by the cold current from the Arctic. This is significant. Not really, but there was a heck of a lot of them with a total of an m6, maybe. This follows a rise in the price of oil, but I haven't looked at natgas. 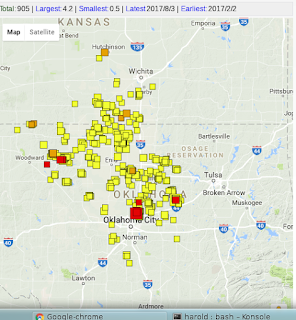 Every time there is a speck of hope people get fracking and send the frack waste to OK. The m4.2 was a shallow thrust and knocked out some substations. That would make it 10 cm/s pgv. I got my two monthly climate charts and I always wait for this one, but the darn guy is taking a summer holiday. All the media is finally into it. The fun begins at guessing the drop in price. The media will take the word of the banks and give us 20% - ha! 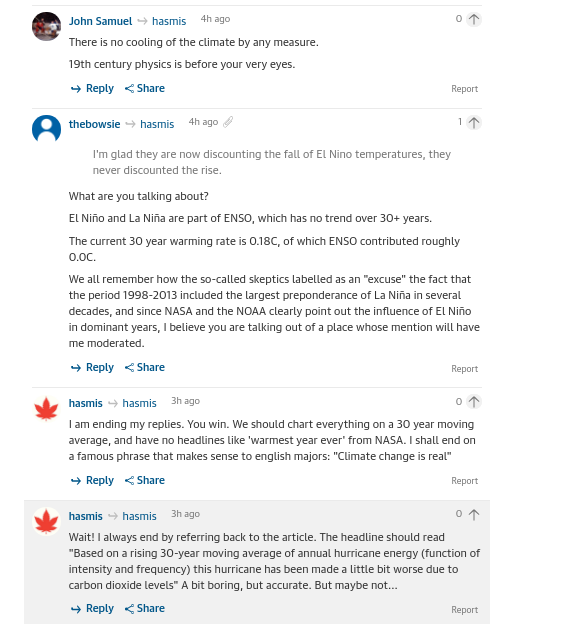 Ding, dong, global warming is dead! 1.0 - We all die tomorrow. Every breath you exhale could melt steel. 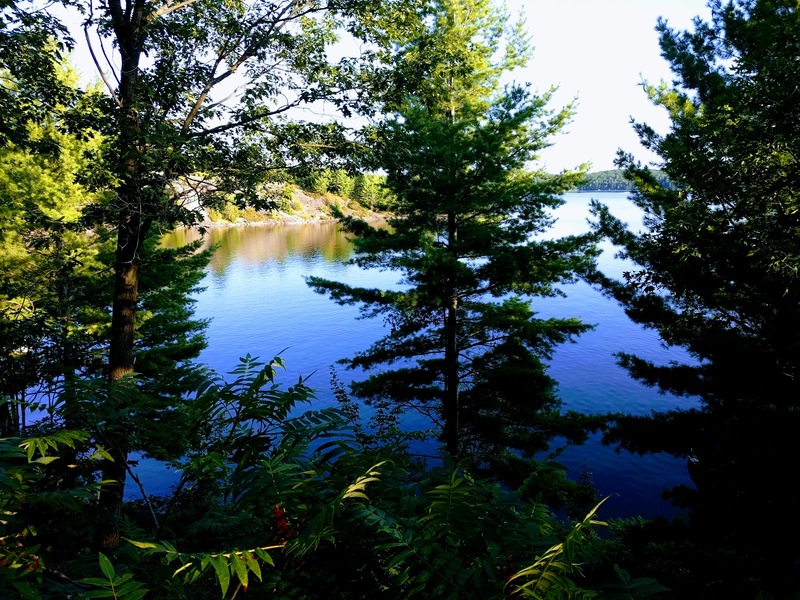 The latest graphs show what we Canadians have known this summer - get more firewood! Although a little summer uptick, the sat-temps show us zooming into a hole, just like Toronto housing prices. And here's a little cheer for polar bear lovers. 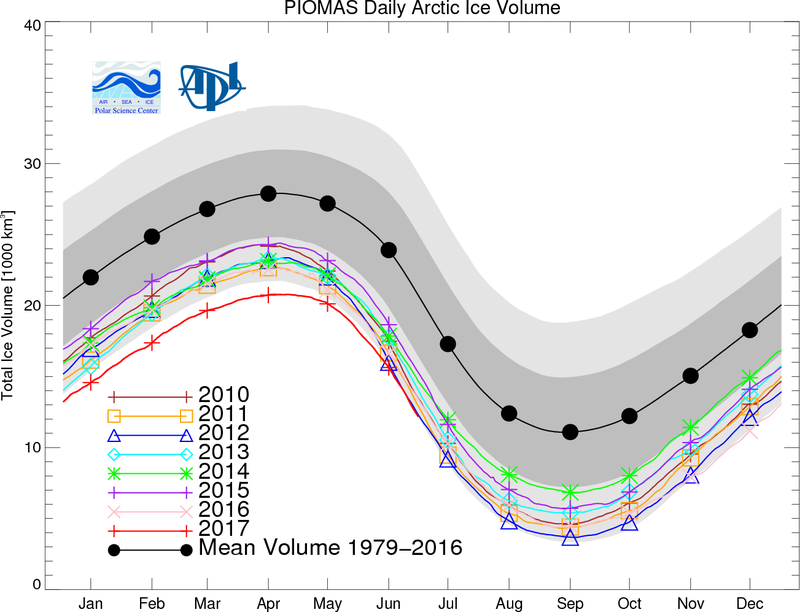 The ice volume is now burying itself into the main band. I suspect we'll start to see it zoom above. That means Trudeau can celebrate. Yeah! We love massive amounts of ice. blah. I'm taking a trip to newfieland this fall. I'll bring lots of winter stuff.